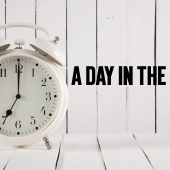 Summer means so many things to so many teachers, and this year for me I plan to build up worthwhile activities for my first graders. There is a lot of small group instruction happening throughout our day. Here is a compilation of new small group and individual ideas that I hope to implement this year. None of these are my creation, and this is just a few of the many. If you have created any of the following ideas I would love to know! I can link everyone up! I have a lot of creating to do this Summer! My dining room is filled with boxes of tag board, construction paper, glue sticks, scissors, binders, file folders, paper clips, etc! An elementary teacher’s dream…. This is a reading pointer! 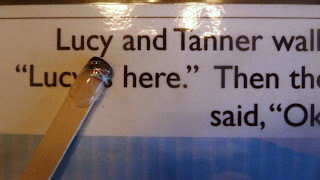 A fake nail on the end of a Popsicle stick with a dot of hot glue and those first graders will be ready to track as they read! The possibilities are endless…googly eyes, pom poms, witch fingers, little themed erasers like pumpkins in October…I do find that after my students are reading past a level 6 these sticks aren’t wanted or needed anymore…. How cute and easy is this idea! I love it! 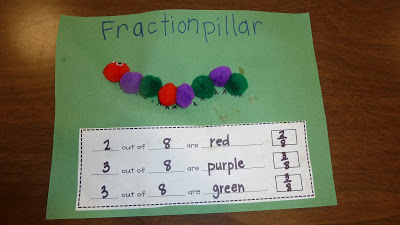 Fractions are so fun. I think I saw this one on the first grade parade. I wish I had this game last year…what a great idea. 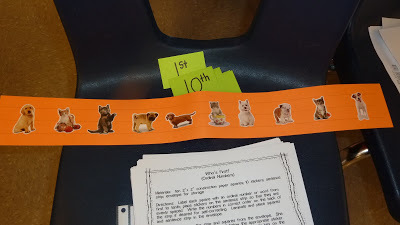 My first graders knew their tens and ones but weren’t as comfortable manipulating the numbers. I think this would help! Just another way to make adding fun! 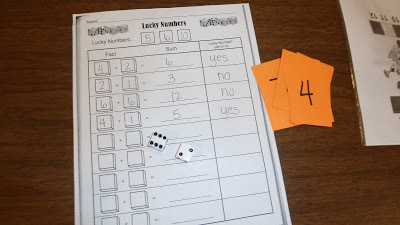 The “lucky number” is the number on the orange card. If you roll that number than it’s lucky. This is a spider. I am going to modify it for October word families. I think I will make the middle look a little different…maybe add some hair scary spider ideas so it looks a little more spider-ish. 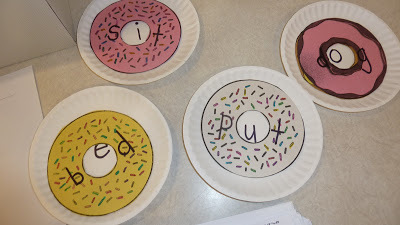 Donut Words- if you pick up the “donuts” and move them to a different plate, you get a different word because your vowel changes. 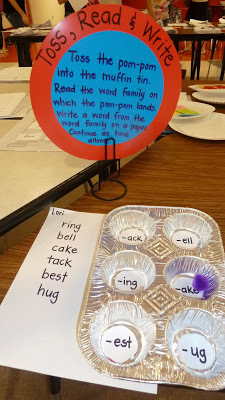 so the word PUT can become PET and PIT etc…They take a donut out of the donut box and lay it on a plate with a vowel to sound out a new word. Then they can record it on the donuts word list. I know I have seen this one on a number of blogs! This is like making words but individualized for word work. 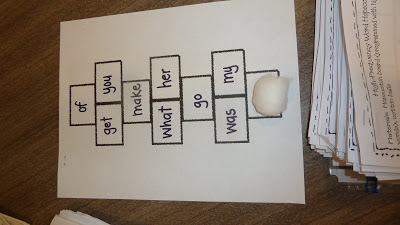 I would use this after my students were independent with manipulating sounds and building words. First Grade Parade Again! 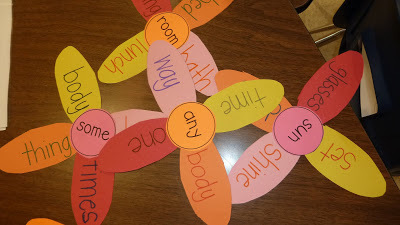 Spring Compound Words. 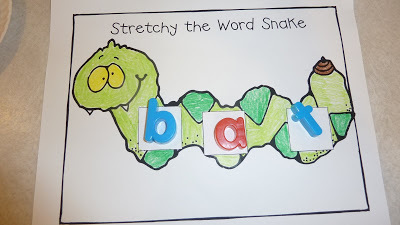 My students think they are so SMART with those LONG compound words. They would love doing this! These look like they came from one of my favorite bloggers but I haven’t tracked them down yet. (sorry it is sideways) They play sight word hopscotch here with a cotton ball..fun and easy. practicing ordinals…the stickers can be anything that appeals to your students…dinosaurs, outer space, cartoon characters etc. 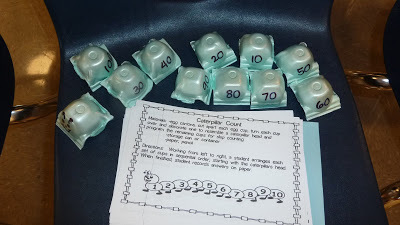 This is great for number practice, place value, and inside you can have them make addition or subtraction problems for the number featured on the outside. 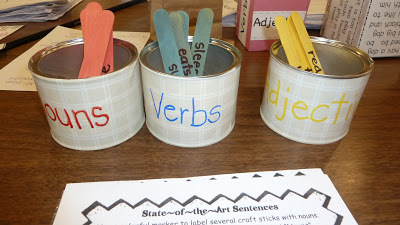 Parts of Speech Cans. 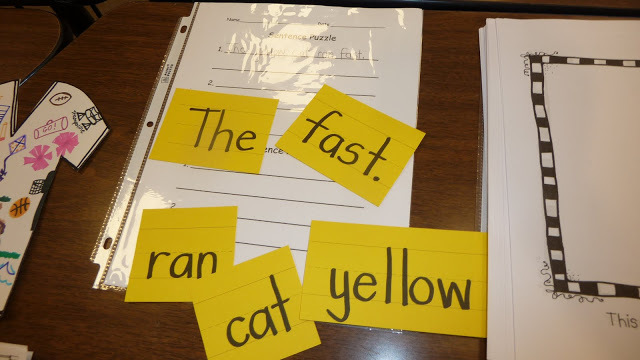 Make and record sentences while teaching parts of speech! 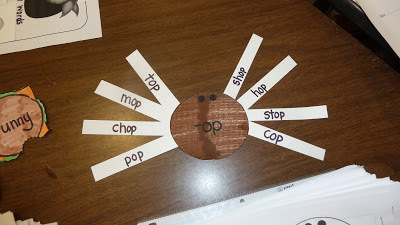 Pick a stick of each color and make a silly sentence! This has many variations. At first they can just pick out the correct story elements for their book. They can also make up a story of their own based on the sticks they pick out of the cup. 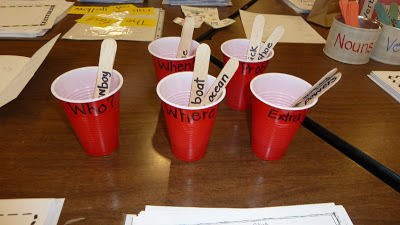 Eventually they could write their story elements for a particular book they have and add them to the cups…great idea! Punctuation Practice. 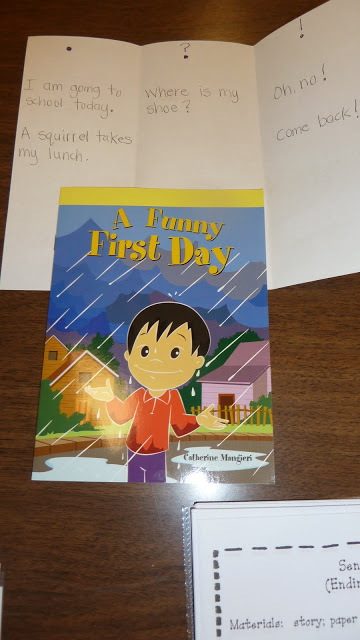 Read a just right book and then make a punctuation pamphlet to go with your story. 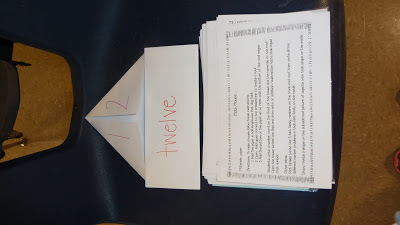 Students find sentences in their story that end with periods, questions marks, and exclamation points. Sentence Strip Puzzle. I can’t get enough of these type of activities. I love hearing them say it wrong and then realize it and change it to the correct way…whatever gets them reading fluently!!! This is a great one for those EL learners too. Foldable activities make not so exciting things much more fun. 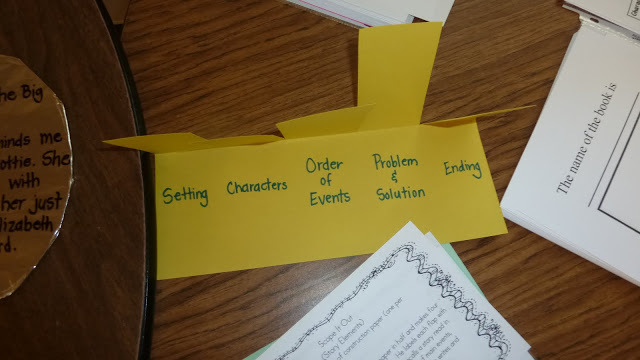 Here is another way to practice those story elements. We usually have the words on the top of the flap and then the students make a picture and add their words to the inside so when you lift the flap you get the information. Here it is shown with the labels on the inside. I love this idea. I have already made all my sandwich pieces and here is a recording sheet I made to go with it. 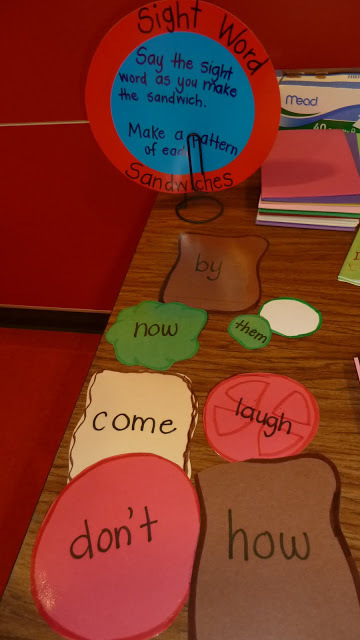 Students build a sandwich saying the words as they build. Then they record their words here. Awesome resources!! Thank you so much for sharing. 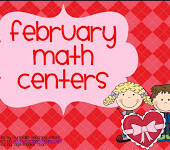 Do you have any printable to go with any of the centers? Again, wonderful ideas!! Thanks for posting at Math Monday!!! So inspiring! 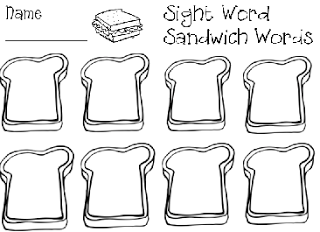 I'm going to make sandwiches for our sight words for first grade! Thank you! Just ran across your blog today. LOVE all the great ideas. I just bought some of the large dot cutouts for my wall, but I am going to buy another set to make the cute stand up signs for my stations! great ideas! 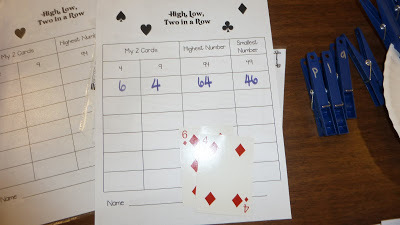 Are the printables somewhere on your site for these great centers? The ideas shown above come from a large group of teachers and I think blogs too. They were shared at a workshop. I took pictures to remind myself of all the ideas I really liked. 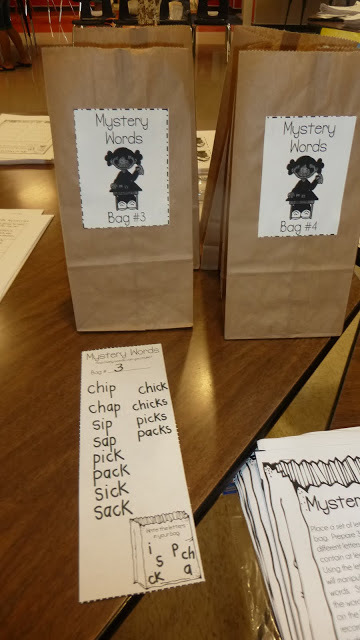 I didn't create these ideas so I don't have the printables to share. Wish I could! Love these ideas! You must be very busy this summer! These are such great ideas. I especially love the word bottles. I LOVE all these great ideas! I am going to be very busy….. I think I'll need more cardstock! I did some digging because I really wanted the blacklines to the Mystery Word bags. 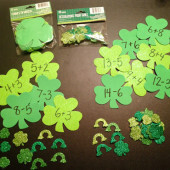 I found the idea posted at The First Grade Parade's blog. Hope this helps ~ thanks again. where can I get the direction sheet for Who's first? 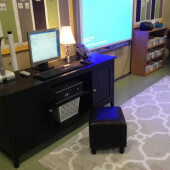 I love your ideas and the way you have organized your room. Was wondering what you do with the Blooms Taxonomy wall . I have been using some of the question stems and was curious about what you were doing. I don't make comments but view you blog frequently.